We provide a great number of different condominium designs. Whether you're looking for a large condo for the whole family or simply a romantic one-bedroom layout, Chesapeake Lofts has the style that's right for you. 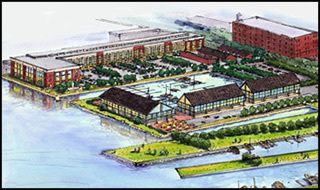 Mid-States Bayfront Development, LLC, is the developer and builder of the bayfront project known as the "Paper District" of Sandusky, Ohio. The waterfront condominiums at Chesapeake Lofts overlook sparkling Sandusky Bay. You will be only seconds from the "Paper District", where you will find all-day fun for your family and friends.